That's right, the long awaited strategy update is finally here! 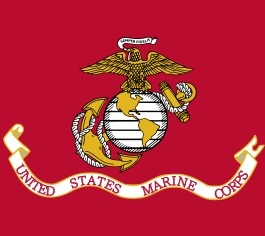 And no this is not a mean April Fools joke such as Sid's mean marine update. Let's look at some of the mechanics and stats of these new units in order to help prepare for their implementation. As some of you know, AtWar's social media websites have spiked up in activity again with multiple weekly posts and moving towards daily posts. AtWar is currently active on four social media platforms (Facebook, Twitter, Reddit, and Youtube) and is expanding to multiple others like Instagram; as well as reviving and updating other websites that AtWar has used in the past to advertise its self. We plan to use Social Media more often, especially on future events as well as implementing them into our planned challenges program (refer to this link if you don't know what this is) and ultimately bring more content into the community. Historically mods would try to let the user know by PM why their message was deleted, but this left other people reading the thread in the dark as to what happened. Now the process will be transparent to everyone. As stated in the original announcement, the test period for the Counter-Insurgency strategy has ended and it has been taken down. We're already working on the next round of new strategies and other upgrades to try out, so stay tuned. We hope to release the next update early April. I'm pleased to announce Brianwl has been promoted to admin. In this new role, he will have authority over all community issues, overseeing the moderator team, and any other tasks that require admin-level access. In short, Brian has the authority and ability to handle anything that previously would have been done by me. He has kindly agreed to help out as I am planning to step back from the community a bit, and instead focus more on just the programming and business side of atWar. I know we will be in very good hands under Brian's leadership. He is a long time atWar player, moderator, and highly respected throughout the community. Question #1: Do you agree with the statement, "toxic behavior has been a serious problem in the atWar community"? Analysis: 63% of respondents somewhat agreed or strongly agreed that toxic behavior has been a serious problem on atWar. Not a surprise here, that's a pretty compelling "yes" from the community. Question #2: How has the level of toxic behavior in our community changed in the last 2 months? 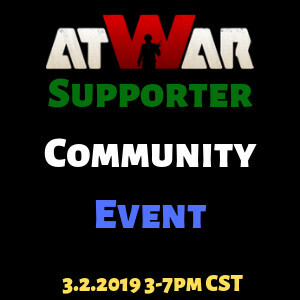 The Supporters Team would like to invite all players to the Official Discord Server this Saturday, March 2nd between 3pm and 7pm CST (Central US Timezone), the following is what we'll be doing. ● Weekly and Daily Challenges. 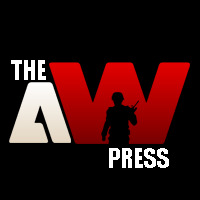 ● The Future of AW Press / ATN. ● Questions from the players. The global Help chat has been replaced with a new Supporter Help chat. To use it, use the command /help from any chat channel in the game. The new Supporter Help chat operates similarly to the Moderators chat and the /report command. When you type /help along with your question, it will be sent to all supporters who are currently online. From there a supporter can reply to you via pr and help you with your issue. No more global Help spam. Most importantly: this should help improve the experience for new players just beginning to learn our game. Note: all players are encouraged to participate, however to keep it fair only 1 vote per person is allowed. Don't use alts to vote more than once, or I'll delete all your votes (both main and alt(s)). Guest accounts will not be counted. EDIT 2019-03-07: survey is now closed, results will be posted shortly.